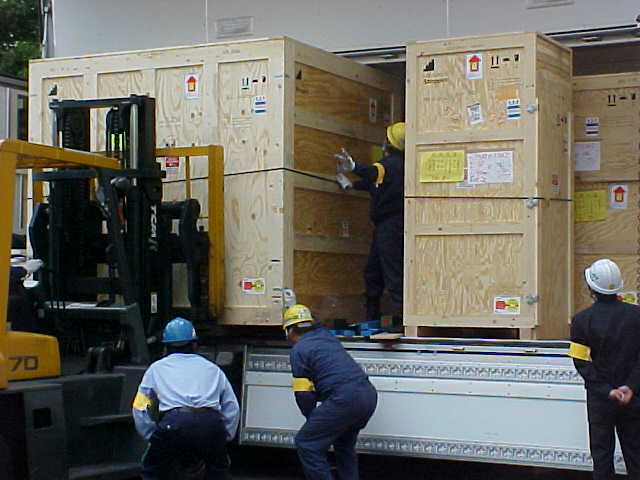 2) Transporting your finished product to an industrial packager’s site to be packed and shipped. But there’s a third option that’s worth consideration: Having the packaging professionals come to you. That might seem like a luxury until you consider that hiring a team of industrial packagers to come to your facility to prepare your product for shipment could help you meet deadlines more reliably, reduce risk, and maybe even save money in the long run. When you do the cost-benefit analysis, you may come out ahead by arranging to have your product packaged in-house—by an outsourced team of packaging experts. Fewer surprises. When the mobile packagers have the finished product “in hand,” they can build the cushioning and bracing inside the crate to match the product’s exact specifications. Since the product has already been fabricated, there won’t be any changes in size or shape during production that could make pre-ordered crating obsolete. Reduced risk. Packaging your product in-house can eliminate the cost and risk associated with transporting your finished product from your facility to the industrial packager’s location—before it’s fully and precisely packaged for transport. Greater safety. The packaging process often involves the use of equipment, such as fork trucks, which your employees may not be licensed to operate safely. Hiring a team of packagers who are licensed, familiar with the equipment, and can operate it with confidence, will eliminate unnecessary risk. Tighter focus. Hiring a mobile packaging team to handle your shipment means that your employees can focus on what they do best: designing, building, and manufacturing your product. Stricter compliance. Some projects (such as those for the Defense Department, for instance) require a strict chain of custody so the customer can easily verify that the finished product was not exposed to various threats. Hiring a mobile industrial packager can help eliminate red tape because it means that the product doesn’t have to leave the manufacturing facility until it is officially en route to the customer. CDC Packaging Can Come to YOU! Hiring a mobile industrial packager can be a wise business decision, not a luxury. Contact us today to learn more about how our mobile team could help your business save money, reduce risk, and improve delivery times.